After the viral story of the Good Samaritan deed of a GrabCar driver recently, another feel good story dominated social media. 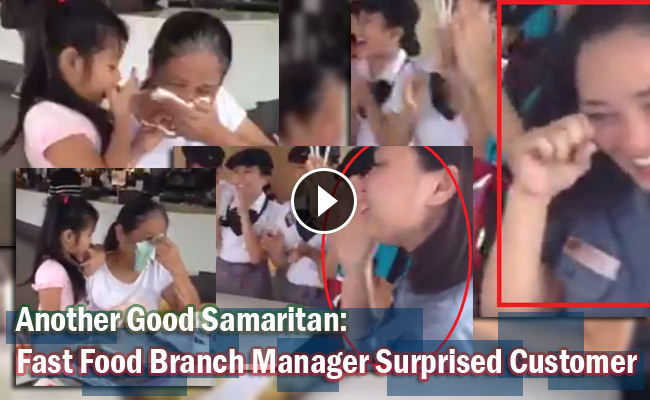 On February 07, 2016 (Saturday), a branch manager of McDonald’s named Sharmain Tacluyan shared a video on her Facebook account about an old lady with her daughter who’s celebrating the latter’s birthday. In the caption, Tacluyan narrated how the old woman approached their store counter asking for a discount for the meal she ordered because she does not have enough money for it. However, Tacluyan stated on her post that she wasn’t able to give discount because there was not any available promo. But the story did not end there. Because even though they were not able to provide any discount for the meal, they set up a small surprise for the kid. Tacluyan, together with her crew and a security guard, prepared pancakes with a “happy birthday” greeting, pumped balloons and played a birthday song for the girl. In the video, Tacluyan looked busy preparing the surprise; she even called some of her crew to go with her and to sing for the girl. After the birthday song greeting, the video was focused to the mother who had been crying tears of joy. Tacluyan also said that she did not expect the mother’s reaction and it could also be seen on the video that she was also crying. She specifically said on her post that moments like that made her feel good as a manager. “Simpleng paraan pero alam mong nakapagpasaya ka.”, Tacluyan said on her post. Netizens praised Tacluyan and her crew for doing such a deed. Some said that they were touched and even cried while watching her video. The video has already gathered around 40,000 likes and more or less 11,000 of shares on Facebook.